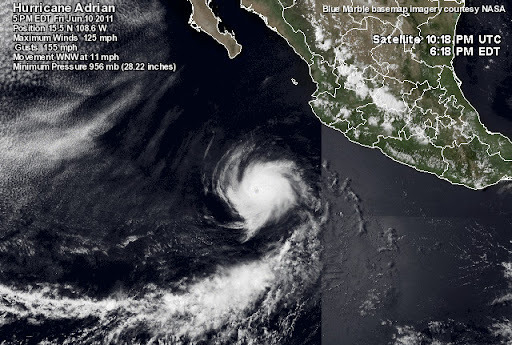 At 200 PM PDT the eye of Hurricane Adrian was located near latitude 15.5 north...longitude 108.6 west. Adrian is moving toward the west-northwest near 12 mph...19 km/h...and the cyclone is expected to continue toward this direction at a slightly slower rate of speed during the next two days. Maximum sustained winds are near 125 mph...205 km/h...with higher gusts. 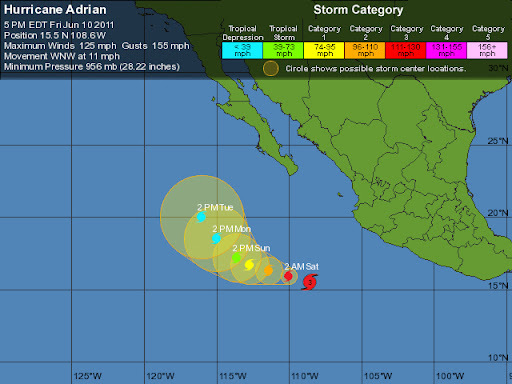 Adrian is a category three hurricane on the Saffir-Simpson hurricane wind scale. Some weakening is forecast during the next 48 hours. Hurricane-force winds extend outward up to 35 miles...55 km...from the center...and tropical-storm-force winds extend outward up to 90 miles...150 km. Estimated minimum central pressure is 956 mb...28.23 inches. Large swells generated by Adrian will continue to affect a portion of the southwestern coast of Mexico today through at least early this weekend. These swells could cause life-threatening surf and rip currents.